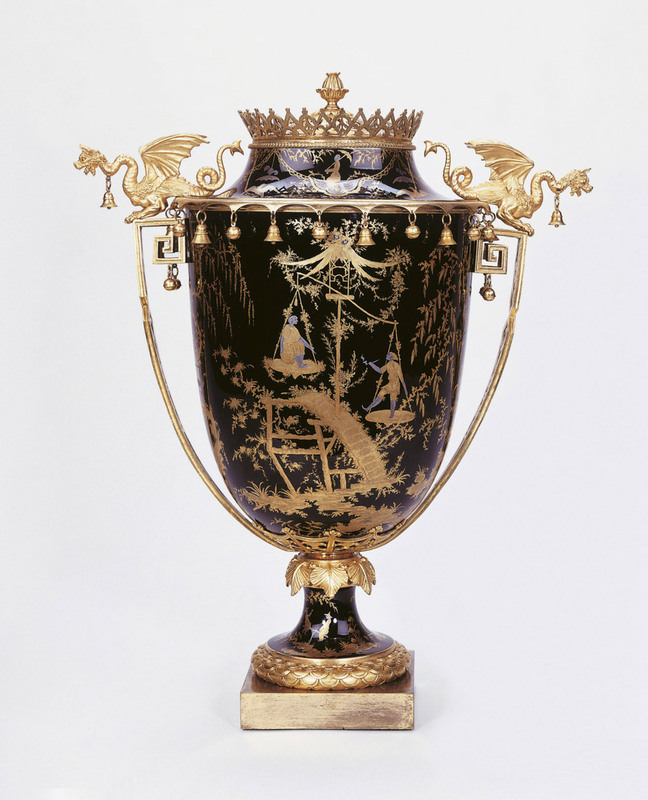 Gilding was the final stage in decorating Vincennes and Sèvres porcelain. Amazingly, these fragile objects had already survived multiple firings, before each subsequent layer of gold was added and fired again, albeit at a slightly lower temperature. The gilding was extremely costly but also important in the age of candlelight, reflecting additional light onto the tea or dinner table. The factory at Vincennes began to decorate with fired gold in 1748, having purchased a recipe from a Benedictine monk. 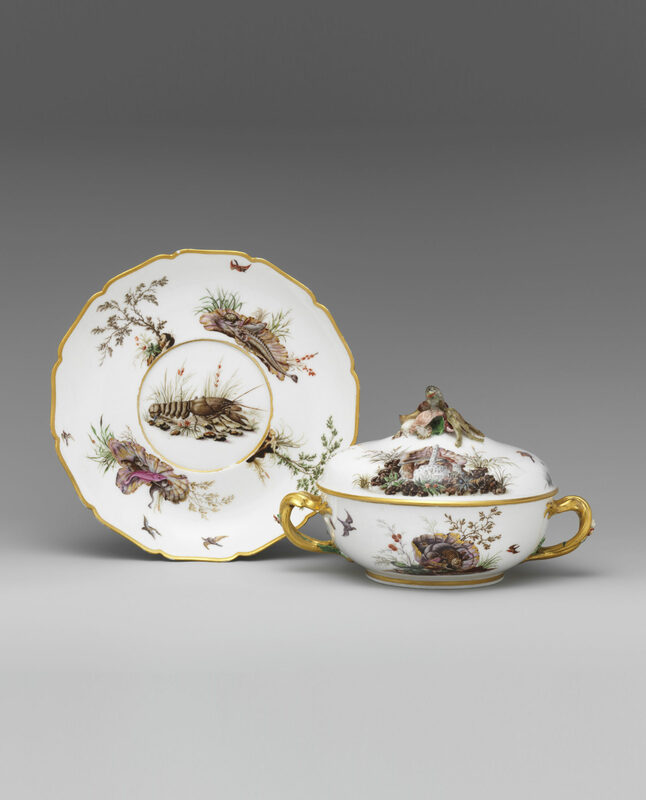 The factory was established to produce painted and gilded porcelain imitating Saxon examples, made at the royal porcelain factory in Meissen. Initially, the gilded decoration was painted on as a paste containing powdered gold derived from gold leaf mixed with honey, garlic and vinegar. The most basic decoration, copied the simple filets or line bands used at the Meissen manufactory. 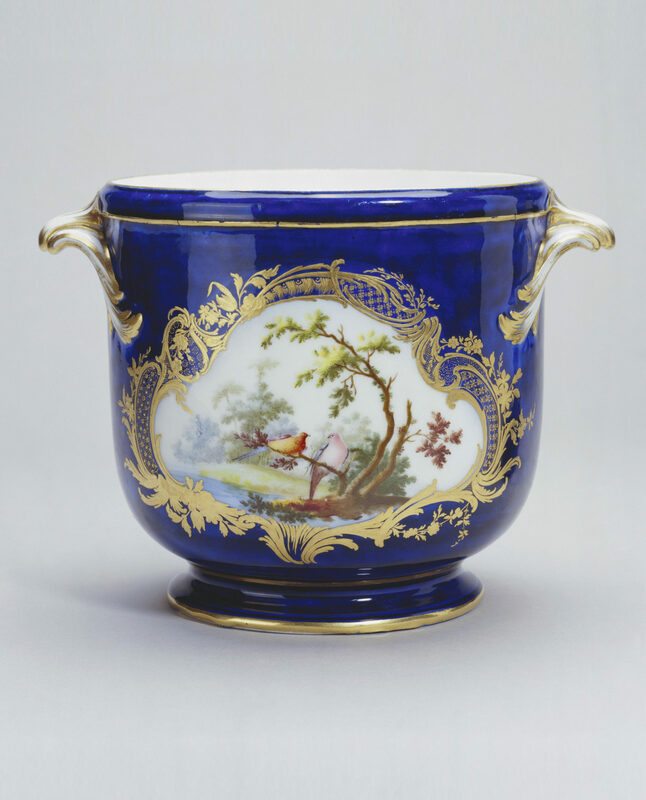 Some of the finest gilding on porcelain was produced in the mid-eighteenth century. The designs were extremely elaborate, as in this wine cooler made in 1754. Here the gilding creates a frame in the rococo style for the painted panels but also hides the fuzzy blue edges. The trelliswork is entwined with identifiable flowers and plants. Only one application of gold was needed on the bleu lapis ground. The resulting matte gold was burnished (rubbed) with polished hardstones to obtain a shiny, reflective surface and tooled (engraved) for fine detail. Rich gold decoration in the neo-classical style was characteristic of Sèvres dinner services made for Catherine the Great of Russia in 1778-9 and Louis XVI in 1783-92, the latter seen here. Some pieces received up to three layers of gold, resembling low-relief sculpture when finished. Gilders only began to mark their work from 1770. Gilders also specialised in working with either soft or hard paste, each requiring different skills. 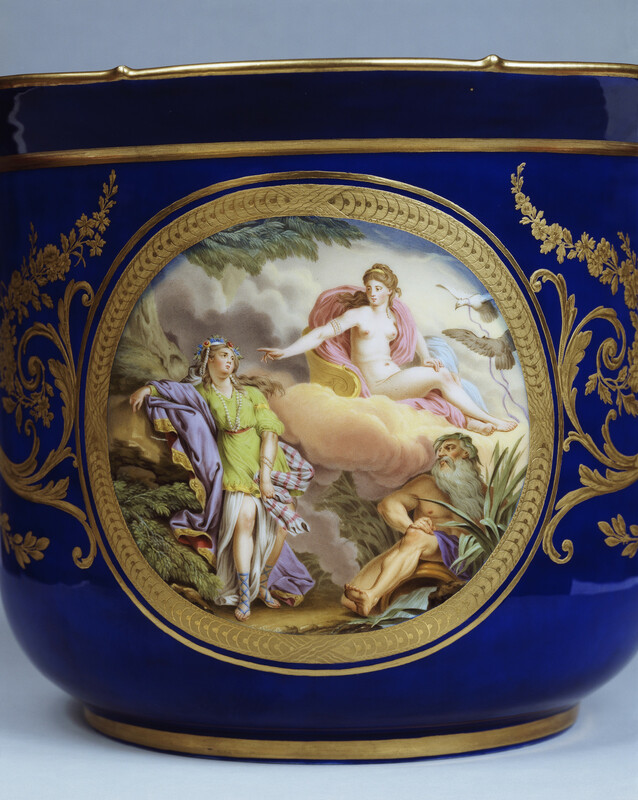 Among the talented gilders working on the soft-paste porcelain service made for Louis XVI painted with a beau bleu ground, were Charles-Nicolas Buteux, fils aîné and Étienne-Henry Le Guay père. The high-temperature glaze used on the hard-paste body introduced in the 1770s required a different type of gilding. This was painted on as an amalgam of mercury and fine gold particles precipitated by a chemical process. 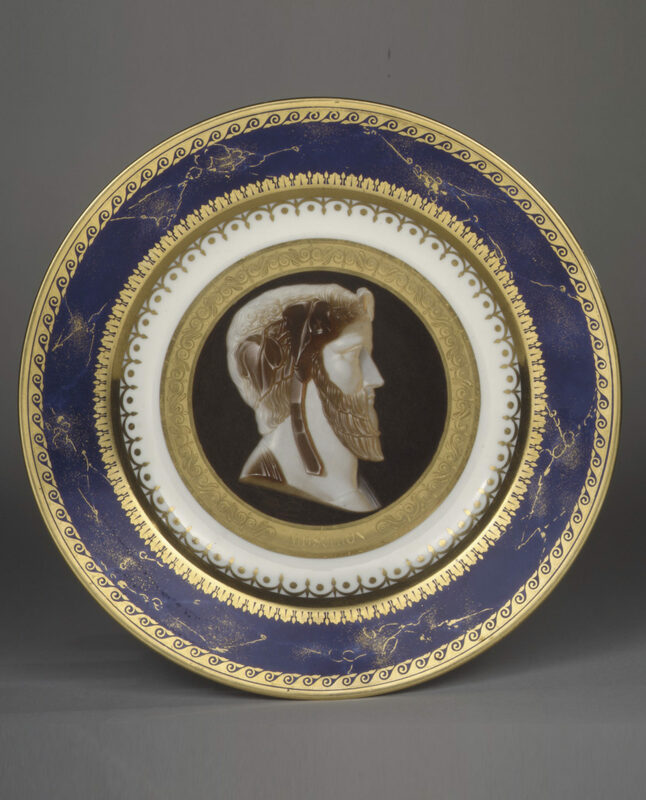 This plate is from the Iconographique grec service, one of which was made for Napoleon’s uncle. The complex technique of ‘jewelling’ was introduced at Sèvres in 1779 and became very fashionable in the 1780s. The process involved the application of drops of enamel in imitation of precious stones (pearls, sapphires, rubies, emeralds, topaz, amethysts, and turquoise) on to gold foils engraved and tooled in shallow relief, which had been formed by means of steel dies. Many of the dies were cut by Jean-Pascal Le Guay, a ciseleur-graveur de matrices, after designs of Jean-Baptiste-Etienne Genest, the head of the painters’ studio. The technique was a speciality of the Swiss-born enameller Joseph Coteau (1740-1812), who may have developed it. 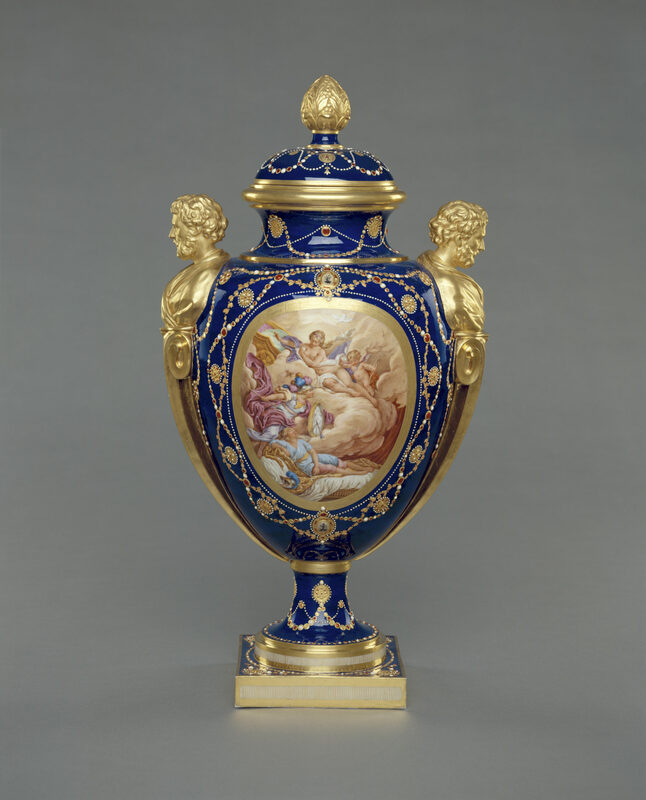 Around 1789–90 Sèvres gilders began to use platinum in place of silver, which tarnishes. Platinum’s commercial application became possible when the factory’s chemists discovered that arsenic could be used as a flux to lower the melting point. Platinum was combined with two tones of gold – yellow and copper red – and the matte and burnished surfaces were then chased with fine details. These new metallic colours were often used on fond noir or a black ground, a blue-black pigment produced from iron and cobalt, applied in thick layers. In reference to the oriental lacquer and porcelain that inspired it, the decoration is often playful chinoiseries.